In a few days the second edition of the Classique Salomon trail running race will be held, an intense race recognized for its beautifully difficult terrain. This Saturday, some 300 runners from several regions will race distances of 1 km, 5 km or 10 km through the trails of Mont Tremblant. I recently spoke with Dorian Baysset, a runner become “trailer” who won second place at the Classique Salomon last year. Here are some excerpts of our conversation, which may help you in your preparation! Q1- Dorian, at the resort you are know to be a good trail runner. You’ve proven yourself by winning first place in the 11 km UltimateXc race last June and have been training with the Salomon Trail running Club all summer. I’m curious to know more about your experience? I developed my interest in running when I was young. As a teenager, I was part of an athletics club and touched different disciplines like sprinting, mid distance and even the long jump, with a preference for endurance races and cross country. Once I got to Tremblant, I quickly discovered trail running and I joined the Salomon Race Club at its inception three years ago. Since then I have been fortunate to travel around Quebec to participate in many competitions, on and off-road. Q2- You gave a great performance at the Classique Salomon last year by winning second place in the 10 km with a time of 53 minutes… Will you try to beat that time this year? I would like to improve my performance from last year or at least match it, but I know that every runner will give their best. On a trail, it’s difficult to compare the time from one year to another because the conditions and course change. The 10 km will be tougher this year, but I’m better prepared. Q3- Why is Tremblant’s course more difficult than others? It’s a very hilly course with fast, technical descents. It can also change drastically depending on the conditions of the day. In any case, with a sequence of climbs and descents for a total of 550 meters of elevation gain, there is little time to catch your breath! Q4- What are your main strengths and weaknesses as a trail runner? I appreciate running downhill on the steeper trails. It requires a certain kind of agility and I think do well on that front. What’s more difficult for me is waking up on cold days. I need a long to warm up and get motivated! Q5- The Classique Solomon is not your first and won’t be your last race this year. What kind of training do you do to prepare yourself for so many competitions? 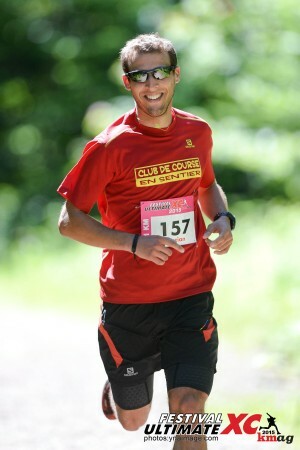 I follow a training regimen and the Classique Salomon race was worked in to my program. My program is pretty diverse and combines interval training, endurance for long distance, more specific exercises… Included in the program are competitions of different distances on different types of courses. With this, I have a clear goal in sight: a 21 km trail running race to be held in Hawaii in early December, the XTERRA Trail Running World Championships. Q6- Do you practice sports other than running to keep you in shape? Yes, I am a sportsman at heart and I love moving outside all year long! In the summer, you’ll usually find me on a bike or walking the local mountain trails. In the winter, I keep in shape with cross-country skiing and alpine ski touring, two complementary sports to develop my cardio. Q7- What is your favorite place to go trail running? I love the Lynx trail along the Diable river near the resort, especially in autumn with all the colors. It’s really beautiful, and in the late afternoon, the sun hits it just right and makes for an amazing view! Q8- Do you have a certain routine before a competition? Not being superstitious, I don’t really have a routine before the race. I simply study the course profile and prepare all my gear the day before to be more efficient in the morning. I also bring more clothes and equipment than needed to adapt to the weather conditions. Q9- Last question. It is recommended to adapt your nutritional intake to the intensity and duration of your physical activity. Do you follow a specific diet for trail running? I’m not advanced enough to have a super specific diet, but I try to eat a good amount of carbohydrates in the days before a competition. On the morning of an event like the Classique Salomon, for example, I’ll eat a slice of toast and a banana and drink coffee 90 minutes before the race. Then, just before the start, I’ll take a little gel for glucose and electrolytes. On longer runs, I’ll take one about every 10 km so I don’t feel a drop in energy. To conclude, I wish a good luck to all the brave runners who will participate in the Classique Salomon race this Saturday, October 24th. It’s a beautiful experience in a warm and friendly atmosphere. I also encourage all readers to come cheer on the runners who will need a lot of motivation, among them, Dorian Baysset!